Every year, the Foundation provides high impact grants that support its mission to help all students at B-CC High School to achieve academic success, promote a school environment where every student matter, attract and retain the highest quality faculty, and strengthen the bond between the school and the community. 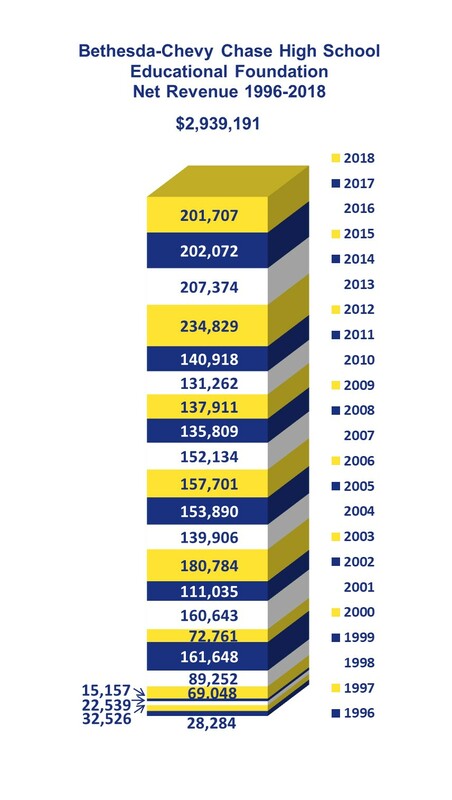 In FY2018, its summer grants funded the 9th and 10th Grade Summer Academies, the Girl Leadership Workshop, the Pre-AP/IB Workshops, and the ESOL Enrichment program. Its academic year grants funded TAP, the after-school academic support program, and program materials and equipment for the Art, English, IB, Music, and PE Departments, as well as the Tattler and the Media Center. Its college-readiness grants supported CollegeTracks and the Essay Writing Workshops. Its Professional Development grants funded speakers and materials for in-school staff training as well as staff’s attendance at workshops and national conferences. 9th Grade Summer Academy: a three-week summer program staffed by B-CC and Westland teachers for incoming 9th graders who would benefit from extra assistance to work on English, math, science, study skills, and general school issues. The Foundation helps fund the annual writing contest, sponsored by B-CC’s student literary magazine, Chips, and B-CC’s English Department, where all currently-enrolled B-CC students are invited to submit entries in four categories (short story, personal essay, poetry, and drama) to be judged by professional writers at the Writer’s Center in Bethesda. 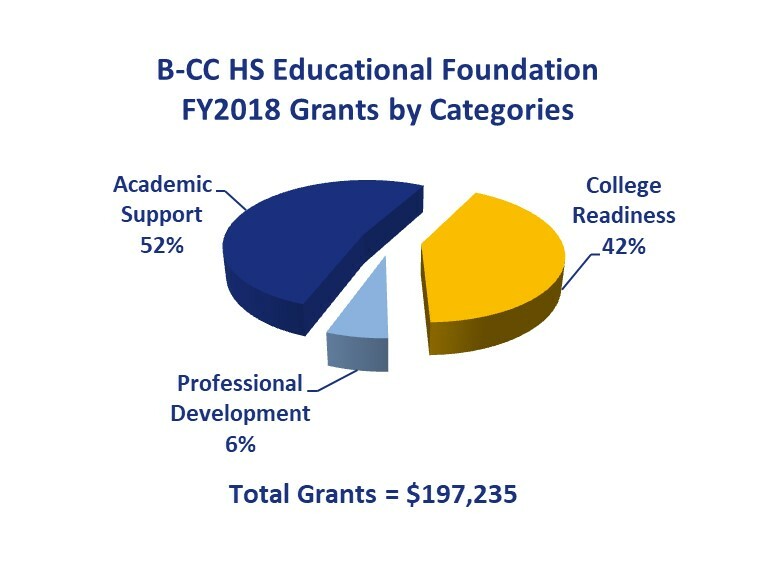 The Foundation’s annual grants program provides funding for equipment, supplies, and support programs requested by various departments at B-CC. Counseling: a grant to cover the fees for fee-waivers eligible TOEFL (Test of English as a Foreign Language) exam takers after MCPS limited aid to only AP and IB exam takers in FY2016. Journalism: a grant to Tattler, B-CC’s student newspaper, to help cover the cost of printing, web hosting, registration, InDesign cloud licenses, animation software for the TV show, the Senior Magazine, and a special 90th anniversary event. Media Center: a grant for the purchase of two Apple iMac computers and a multimedia projector that has the resolution, brightness, and image size needed for large group presentation, facilitating multi-class events in the auditorium, cafeteria, and gymnasium. Music: a grant for the purchase of two ipads to replace older laptops allowing better recordings and other options to enhance rehearsals, and a scanner to scan music for posting on the website to facilitate access by students. Physics: a grant for the purchase of customizable model rocket kits. Technology: a grant for a projector and equipment to reconfigure the classroom to facilitate instruction and student interaction. Lazarus Leadership Fellows Program: a grant to help cover the expenses of the Lazarus Leadership Fellows Program which teaches and strengthens leadership skills in 10th and 11th graders through a series of seminars and meetings with local leaders as well as the development and implementation of a 200-hour community service project by each student addressing a need the student has identified in his/her community. The Foundation’s professional development grants provide funding for teachers to attend workshops and conferences, and for professional day speakers and workshops at B-CC.